Welcome to Rachel Garlinghouse. So glad that she submitted a post because in reading her words, I have a good sense that she is awakening to the many layers that are a part of the human heart – for both the adopted person AND the adoptive parent. And that as she allows herself to “be still and listen,” that her heart is dialing into her childrens’ hearts, her own heart, which will be the very moments when vulnerability leads to connection – holding the reality that joy and pain exist together. I was rocking my infant daughter in the soft, quietness of her room. The glow of the nightlight surrounded us as we eased forward and backward. Her eyelids were heavy, dreamy. She was too big to be swaddled anymore, so I had gently draped a handmade pink blanket over her round body. She had pulled the blanket up to her eyes, so only her curly, black afro and her long, curling-upward lashes were visible. I had waited fourteen months for this precious bundle of joy. And now, I had the honor of rocking her to sleep. It hit me, as her breathing became steady indicating that she was drifting off, that she was ten months old today. The old ladies at the grocery store were right. Time does fly. I smiled to myself in the dark, adjusting my daughter’s blanket. And in a heartbeat, my peaceful spirit gave way to a flood of sadness. The amount of time my daughter was with her first mother. Forty weeks is a long time for a child and mother to be together. And not just together, but one. Breathing the same air, digesting the same food, hearing the same voices, feeling the same steps. And once my daughter was born, the oneness broke into two. And then I entered the picture, number three. Second mommy. And then first mom was gone, and it was just me and the baby…forever. Adopting can best be described as bittersweet, complicated, and intricate. There is so much joy intertwined with deep pain. The emotions surrounding adoption collide, especially on days when I realize the significance of the moment. Tears quietly trailed down my cheeks as I watched my little girl sleep. My heart ached for her first mother, for the future pain my daughter would face, for past and present loss, for confusion, for uncertainty. And fear crept in. How would I be able to answer my daughter’s questions? How can I take her pain away? How can I assure her, and she believe me, that she is loved so deeply by two mothers? That she was wanted and cherished? That she is worthy of great things? This moment with my daughter was five years ago. And since then, we have adopted two more children. And we’ve had many, many more moments where the complex nature of adoption has weighed heavily on our hearts and minds. Firsts experienced by us, the seconds. I realize that my initial fears and questions, particularly, how can I take my children’s pain away, needs to evolve. Instead, how can I help my child navigate through normal emotions that stem from adoption? Over the past five years, I have learned and grown. To listen more and talk less. To speak encouragement and love into my children’s hearts. To be ever-mindful of my need for Christ and His guidance. To meet my children where they are. To be strong and confident, while also being humble and vulnerable. To embrace nature and nurture. Harder questions are coming. Tougher moments will arrive. Heartbreaking conversations are simmering. My three babies are growing up and coming to new conclusions about how life works. And this second mommy is going to try her best to answer, love, listen, embrace, and empathize. And this second mommy vows to never let my heart become hardened or my mind to become exhausted of the bittersweet, complicated, intricate nature of adoption. Rachel Garlinghouse is the author of Come Rain or Come Shine: A White Parent’s Guide to Adopting and Parenting Black Children and Black Girls Can: An Empowering Story of Yesterdays and Todays. Her work has been featured on The Huffington Post Live, MSNBC, abcnews.com, Scary Mommy, Essence magazine, and NPR. 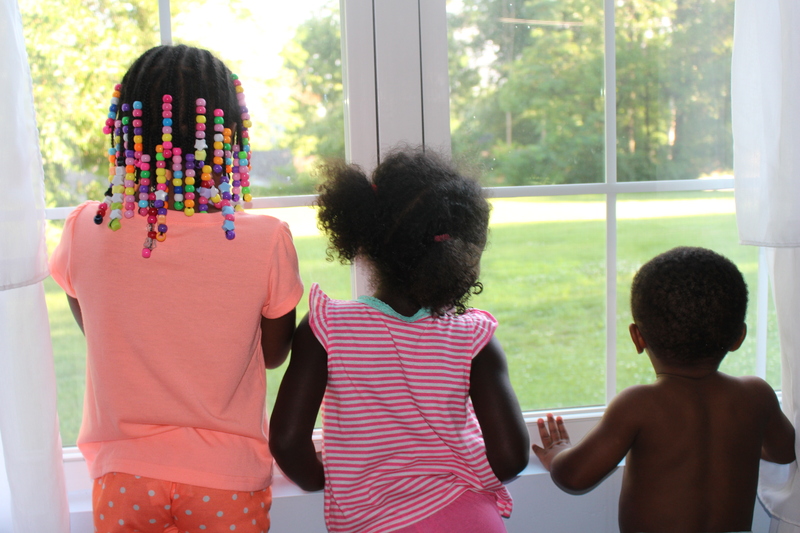 She writes about adoption, attachment parenting, and race at her blog and over at adoption.net. She lives in St. Louis with her husband and three children. Connect with Rachel on Facebook and Twitter. This entry was posted in november 2014 and tagged adoption, adoptive parent, carissa woodwyk, guest blogger, human heart, national adoption month, rachel garlinghouse, Story, we need one another by Carissa Woodwyk. Bookmark the permalink.